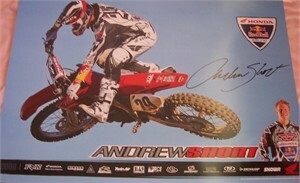 Honda Racing 13 by 19 inch mini promotional poster autographed by AMA Supercross racer Andrew Short. Obtained in person at San Diego signing many years ago. With certificate of authenticity from AutographsForSale.com. ONLY 2 LEFT.